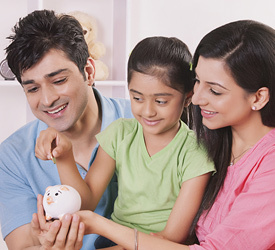 Give your child a bigger Piggy Bank to save all their money. Regardless of their age, Our CUBS-Savings Account enables your little ones to possess a bank account like their parents. Your child also receives attractive gifts and personalised pass book. No charges for non-maintenance of minimum balance for the first year. Facility to deposit money in the school premises on predetermined days. After completion of 14 years of age minor/ student can operate the account. Conditions of minimum balance of Rs. 500/- is only applicable for first year.